Police have appealed for calm after officers were attacked and cars torched by masked youths apparently angered by the removal of wood from the site of a nationalist bonfire in Belfast. The disturbances in the Markets area, close to the city centre, saw officers targeted with petrol bombs, bricks and bottles while a number of cars were destroyed. The incidents have centred in the Stewart Street and Friendly Street areas of the predominantly nationalist neighbourhood. Meanwhile in the Divis area of the Lower Falls Road, a derelict Credit Union building was set alight. 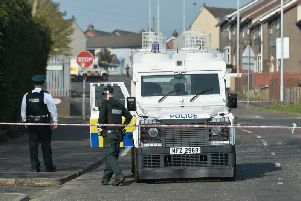 Police Service of Northern Ireland superintendent Andrea McMullan blamed the "localised" disorder on a "small group of youths". The force tweeted: "Police urge for calm to remain after dealing with some localised disorder in Belfast tonight incl blaze at disused building in Divis. "Thanks to all those in affected communities who helped settle tensions. People living there do not want this type of behaviour." The disorder was heavily condemned by local politicians. Sinn Fein councillor for the Markets area Deirdre Hargey said: "The damage to cars in Stewart Street is unacceptable and I condemn those responsible in the strongest possible way. "Both commuters and residents have been affected. Cars have been smashed with stones and several have been set alight. It is nothing short of mindless vandalism." Ms Hargey said there had been other incidents of vandalism over the weekend. "There is no defending this behaviour at all and it needs to stop now," she said. "I'm asking all parents to take responsibility for their children and know where they are at all times. "The community does not want this type of behaviour and it's not representative of the people of this area." SDLP councillor Tim Attwood tweeted: "Outrageous old credit union building torched in Divis - no place for mindless thugs destroying our community." There have also been unconfirmed reports of attempts having been made to hijack vehicles in the area. Democratic Unionist former minister Paul Givan tweeted: "Senseless acts of vandalism that endanger communities and damage services. "Thinking of police and fire crews dealing with these incidents." The vandalism unfolded after wood from a bonfire site was removed from the area in a Belfast City Council operation on Monday morning. Tensions have been raised in some loyalist and nationalist areas in Belfast this summer amid efforts by the council to take action against a number of unregulated fires. Bonfires will be lit in some nationalist/republican areas later this week to mark the anniversary of the introduction of the controversial state policy of internment without trial. A council spokeswoman said: "We can confirm that bonfire material was removed from a car park during an operation in the Markets area."